May in Tennessee is celebrated with festivals designed not only to highlight the charms of Tennessee, but also as a cultural exchange exercise, honouring a different 'guest' country each year. Kicking off the month is the Beale Street Music Festival, 'one outrageous party', taking place over three days, with four stages on 13 hectares (33 acres) hosting Cajun music acts alongside the mighty Mississippi. This is followed up by the Desti-Nations International Festival featuring activities, displays, and cultural exhibitions relating to the chosen guest country. 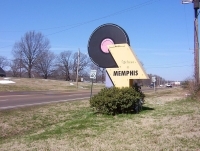 The other three main events of Memphis in May are the World Championship Barbecue Contest, the Sunset Symphony, concert on the riverbank, and the Education Program. The Sunset Symphony is the oldest event in Memphis and includes all-day musical performances on the banks of the Mississippi, an air show, a performance by the Memphis Symphony Orchestra, and a fireworks show. The Education Program aims to educate the state's students about the guest country for the year, through the means of specially developed curriculums, exchange programs, competitions and more. A Barbecue Contest is held at the Tom Lee Park, where teams are encouraged to decorate their stands while they grill meat that is judged by a panel of barbecue experts. Additional entertainment includes a Ms. Piggie Idol competition, a t-shirt competition, and a best booth competition.